This is a dark alley that is rather dangerous. It normally has discarded scraps of old or rotting food and some materials. It is normally damp and has some gas leaks so be cautious! Also a place to scrap some food. From a distance BlackRose eyed the Dark Alley with interest. She sniffed the air searching for any danger before carefully walking into the beginning of the alley. Ears back and hackles raised she treads cautiously glancing back over her shoulder now and then to make sure she isn't being followed. I just have to get through to the other side, no big deal She tried to reassure herself in her head over and over again but the sneaking suspicion of potential danger made her uneasy. As she took a step her paw landed on a small sharp rock, causing her to let out a surprised yelp. Realizing she could of been heard she stood stiff with fear, looking around to make sure no one was near. Kisou, a 300+ pound ball of you don't want to mess with me. Heavy paws slamming against the alleyway floor along with the clicking of his claws as he scavenged for food. Tongue lolling out the side of his mouth as drool bubbled from the sides of his lip. Tail lashing as he panted despite the cool air beating against his face. He was following a peculiar scent, the smell of a trash can.. and though they may not have enough goodies to fill up his stomach.. there is enough to satisfy it for a short time. 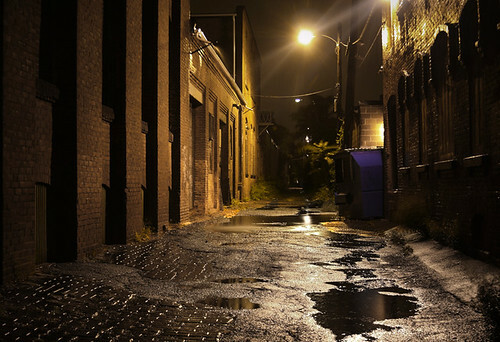 As he loped down the alleyway, passing old apartment buildings,and just plain old brick allies he skidded to a stop. He heard something.. a yelp. His fur bristled as he knew that lovely sound, competition for food. That was his call as he began to track the direction of the yelp through winding alley ways in now complete and udder silence. BlackRose's ears perked up as she smelled an unfamiliar scent approaching. She stood up more making herself taller and planted her paws firmly to the ground. Slightly raising her tail her heart began to beat rapidly I can't run away, It might provoke whoever is coming she stared down the alley, bracing herself for who ever was coming. She felt a little hope that who ever it was would just turn around and go away, but she knew better than that. It was than he burst into a small round clearing that had many different ways to go. Than.. than he spotted her. His fur bristled "You? Where's the food" He snarled, even with her attempts to look larger he was still massive in size. Tongue washing over his lips "Tell me, before I decide to have you as an appetizer." he said, not really meaning it.. after all he did make a promise never to kill or do serious damage to a female.. damn those promises he made! Keeping Her stance BlackRose she slightly dipped her head respectively " I do not have any food nor do I know of any's location. I was only passing through to get to the other side I swear " she regrettably looked into the eyes of the massive dog. She began to feel shaky and more uneasy but she managed to keep her position and try to look strong. Kisou lashed his tail, feeling the stare of the females into his amber eyes, the uneasy and aggressive feeling consuming him as he approached closer. "What exactly are you playing at, mutt." He hissed between his fangs, putting extra emphasis on mutt. Fur bristling as he looked on the brink of attacking, but in reality he was hoping to scare it out of her. She took a slight step forward and eased up a bit, trying to look a little less threatening. " I am not playing at anything, If it is food you want I will help you look for it. But I swear I haven't found any " the fur on her back flattened back down and she gave her tail a slight wag in a attempt to show a friendly gesture. She eyed the stranger carefully glancing at a few exits just in case her attempt at peace failed. Kisou thought, she could be of use.. two heads is better than one.. Finally his tail lowered as his face churned neutral. "Hmph.. well two heads is better than one. I am not promising to give you any share of the goods though." He said as he walked past her to the center of the alley. Nose flaring as he also kept a good watch on her, remembering her scent.. "Smell anyways ways that might possibly have some sort of garbage we- I mean I could eat?" He said, stammering oly a bit before sighing and glancing over at her with piercing amber eyes. BlackRose perked up her head and gave a slight smile " Yes sir ". She trotted to a few path ways and began to sniff at the ground curiously. Trotting back and forth around the area until she picked up a scent leading down a cleaner looking alley entrance. She looked back at the stranger with hope in her eyes " This way, I can smell it faintly but I think some might be down here " she looked back down the alley way with determination and cautiously walked in. Atlas slunk through the streets, his coat brushing against the walls of the buildings he passed. He learned sticking to the side, well away from the streetlights were a lot safer. The crashing sound of a trashcan brought his ears to attention, lifting his nose he could smell the scent of another dog, close by. Most likely in a nearby alleyway looking for scraps. As he crept closer to the mouth of an alleyway before him he could smell the scent of the canine even stronger. Scratch that, there were two dogs in the alley. He peeked his head through, ducking away instantly as he heard movement. He knew he shouldn't get too close, getting in the way of the other dogs one too many times proved that to him. He was curious though, the female and male were obviously looking for food. Going in on impulse he stepped into the mouth of the alleyway. BlackRose's ears perked up and her attention was drawn away from Kisou. A new scent had caught her attention and she listened for movement. She peered behind her into the darkness of the alley way. "Hey uh stranger sir? I think we have some company" she whispered. The fur on her back began to rise and her uneasy feeling returned. "It's Kisou." He muttered as he churned around, fur bristling as his lips peeled back to reveal his canines as he gave out a viscous growl. It was a male, of all things it had to be a male! He hated them, despite himself being one he hated the rivalry, he hated the competition! Not that there was much competition here, the last thing he wanted was another tag along. "Who the hell are you? Unless you want your neck snapped I suggest you scurry on your way, for I will not hesitate." There was one thing he loved about males though... there was no promise made that he couldn't hurt them..
Atlas gave out a nervous little grin. The male was quite aggressive and with his size Atlas believe the threat. He stepped closer, keeping his head low and his breathing calm. "I don't mean you two any harm, there's no need for violence.."
With the way Kisou reacted towards Atlas' presence made him sense some dominance issue. If it was because of the female he was uninterested, she was certainly beautiful but not his type. He'd have to tread near the male lightly, he wasn't really in the mood for a fight, he doubted he could do much he hadn't eaten in a couple of days and it was starting to wear on the canid.